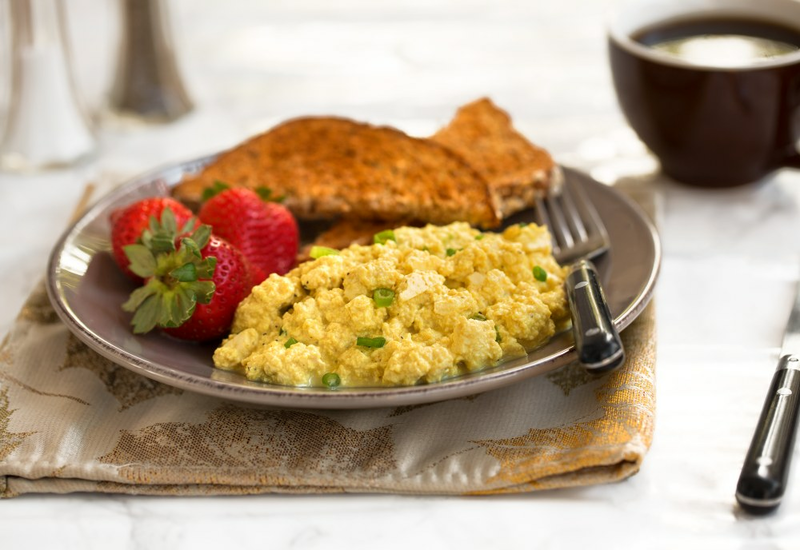 This wholly plant-based breakfast has a creamy and buttery texture just like any softly scrambled eggs. When served hot out of the skillet, you would be forgiven for doubting that it's actually tofu! Using a combination of spices and cheesy nutritional yeast adds lots of flavor, and a little arrowroot powder helps mimic the texture of traditional eggs. Use your choice of soy, almond or other plant-based milk to add creaminess—just be sure that it's unsweetened. The scramble is a great source of protein for vegans, vegetarians, and anyone avoiding dairy—especially when served with toast and vegan bacon! To really nail the distinctive flavor of chicken eggs, replace table salt with kala namak (also known as “black salt”) which can be found in Indian markets. Experiment with other seasonings if you like—stir in chopped chives or herbs, or sprinkle some of your favorite plant-based cheese. Per Serving: 260 calories; 19g fat; 12.1g carbohydrates; 13g protein; 10mg cholesterol; 420mg sodium. I made this tofu scramble for my wife, and it was really easy. She loved it, it's one of her favorite weekend breakfast meals. We tossed in a little spinach with it, and it was perfect. I heard my friend talk about a tofu scramble, and finally decided to try it out. This recipe was surprisingly easy and delicious! Nutritional yeast is the perfect ingredient, and almost gives it a cheesy flavor. The small amount of turmeric gives it that yellow egg color, so you really can't even tell the difference! The best tofu scramble recipe! The nutritional yeast adds a yummy cheesy flavor. Absolutely delicious! I made a southwestern style tofu scramble with added bell peppers and black beans, and served it with warm tortillas. It's definitely as quick as making regular scrambled eggs. I should have drained the tofu more, but the recipe still turned out good. I added extra nutritional yeast to give it more of that cheesy flavor, and I didn't use soy sauce. I love the garlic and onion powder flavors though, so good! My best friend is a vegan so I made these tofu eggs for her and she loved them! That's saying a lot because she's been eating plant based for years and is also a chef! I followed the recipe exactly, and served it with "bacon" and grits.